HOME/NEWS ARCHIVE/Van Alarm fitted in Mirfield, Wakefield. Van Alarm fitted in Mirfield, Wakefield. We were contacted by a existing Safe & Sound customer to install an alarm system on his new van. We originally fitted an alarm to the customers old van in Bradford over 4 years ago so it's nice to have returning customers. We must be doing something right! We first arranged to install the van alarm at the customers work address in Bradford but due to the weather we eventually carried out the fitted at his home location in the Mirfield area of Wakefield. The van alarm of choice this time was the Sigma S32 Thatcham Approved Alarm. This alarm is designed to operatre through the vehicles existing remote central locking control. This eradicates the need to have a second remote on your keys and allows the use of the factoy fiited deadlocks. So how does this van alarm fitted in Mirfield, Wakefield actually work? It listens to the vans electrical system and when it detects the vehicles deadlocks activating it arms itself to protect the doors, bonnet, boot and the usual things a van alarm fitted in Wakefield does. 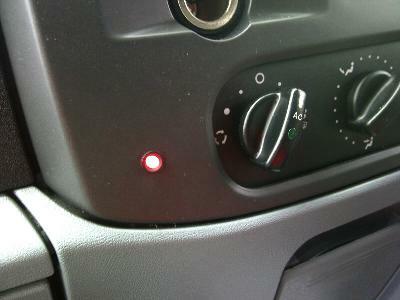 We also installed an additional siren with this van alarm in Wakefield too... You can see this in the picture below. Also in the picture above you can see this van alarms fitted LED on the dashboard which will warn potential theives in the Mirfield, Wakefield and at his work address in Bradford that the vehicle is protected with a Thacham Approved Alarm.